From British Commerce and Industry 1934. Austin exports for the current year (1933) have already exceeded by 60 per cent those of the previous year. Austin car registrations top the list in some overseas markets (against all comers, and not British only). The new features in the 1933 Olympia programme such as cross-braced frames, synchromesh transmission, and, on some models, alternative engines, should prove most welcome abroad and help to maintain this advance. Austin Seven and Ten-Four models are now available with left-hand steering and controls. Practically all models for export have extra ground clearance, and the suspension system on each chassis throughout the range of fifty models incorporates special export features capable of withstanding the rigorous conditions met with abroad. Triplex toughened glass which will not discolour under tropical conditions is also used without exception on every car for overseas. All these special features combine to enhance the one quality which above all others renders Austin cars so popular throughout the world, namely, their outstanding and unfailing dependability. 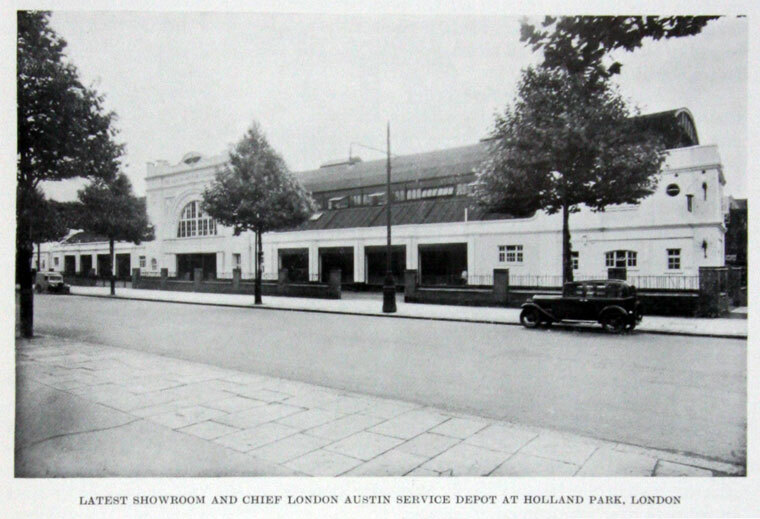 It occasions no surprise, therefore, to learn that in the period of unprecedented depression from 1929, the home of the Austin car at Longbridge was one of the brightest spots in the British industrial fabric. That this is likely to be maintained, there is no doubt whatever, for the new Austin programme, embracing both the home and export markets, contained an announcement of cardinal importance in the history of motor manufacturing. This has made the hitherto standard type gearboxes for motoring almost obsolescent. 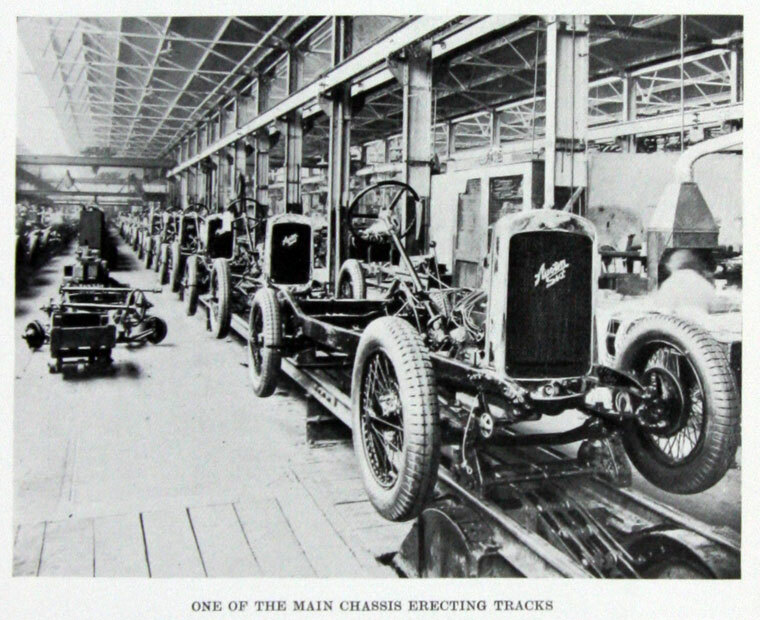 Gear changing is to become a memory — to many a painful one, and it is the Austin interests which are again responsible for giving the lead to motor manufacturers in all countries by their announcement that in future a new synchromesh gearbox is to be standard on all the fifty distinctive models issuing from Longbridge. Other developments included cross-braced frames designed to ensure even further rigidity and stability of the car under any road conditions; alternative engine ratings for the Austin Sixteen and the Twelve-Six; an entirely new Sixteen Saloon on a long wheelbase of ten feet; a new body, the Ascot, on the Twelve-Six drop frame, cross-braced chassis; and new Sports models - an attractive Ten-Four Sports tourer, a handsome low-built Greyhound speed-saloon on the special Twelve-Six chassis, and, of course, the irrepressible Austin Seven as a Sports two-seater; finally, four useful vehicles in the Austin range of vans, namely, the Seven with a load capacity of 5 cwt., the Ten-Four, capable of carrying 6-8 cwt., and Light Twelve-Four and the Light Twelve-Six, designed for a load of 7 to 10 cwt. In 1905 the Longbridge site was occupied by a few bays of empty workshops far removed from the industrial activity of Birmingham. It was outside the current of Britain's industrial life, a mere backwater. 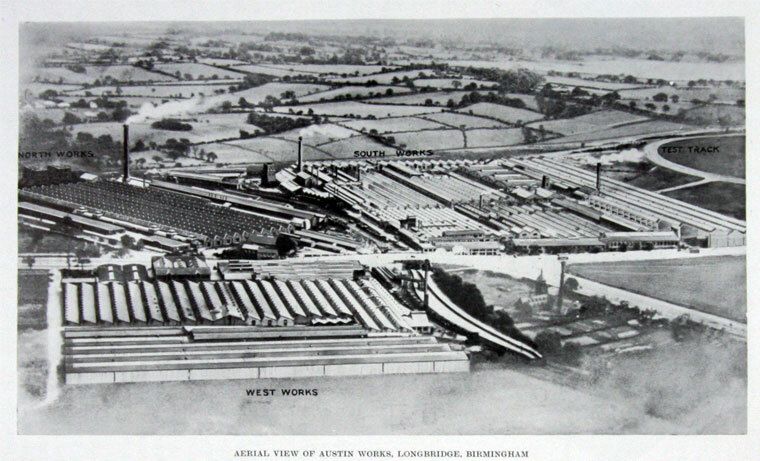 The aerial view of Longbridge indicates the transformation that has taken place. Let us give the saliencies of the consistently planned developments since 1919. The production lessons learned during the busy war years influenced vitally the methods of production adopted for the post-war Austin cars. It is only necessary to repeat the figure of 2,500 cars for 1922 against the number of 2,300 workers employed, to realize that the output in terms of labour was even then immeasurably higher than before the war. The Austin Twenty, the first model produced by the Austin Motor Company after the war, was also the first to be made in England by mass-production methods. It met with immediate success and was in immense demand, so much so that the price had to be increased by as much as £100 to discourage buyers, and to prevent the waiting list of would-be purchasers from becoming embarrassingly large. But the conditions which immediately followed the war were highly artificial, and in the subsequent depression even the most virile firms found it most difficult to carry on. In this crisis the genius of the founder as a designer came to the fore. By the introduction in 1921 of the Austin Twelve and in rapid succession in 1922 of the Austin Seven, the future of the Austin Motor Company, and very largely the future of the British motor industry, was assured. These cars have since been supplemented by the Austin Sixteen-Six, the Twelve-Six, the Light Twelve-Four, and the Ten-Four — all popular and selling on an expanding scale. The output of 1922 is just about ten days' work of to-days factories of some 220 acres total extent, and employing over 14,000 workers. But these figures show something more than mere immensity. 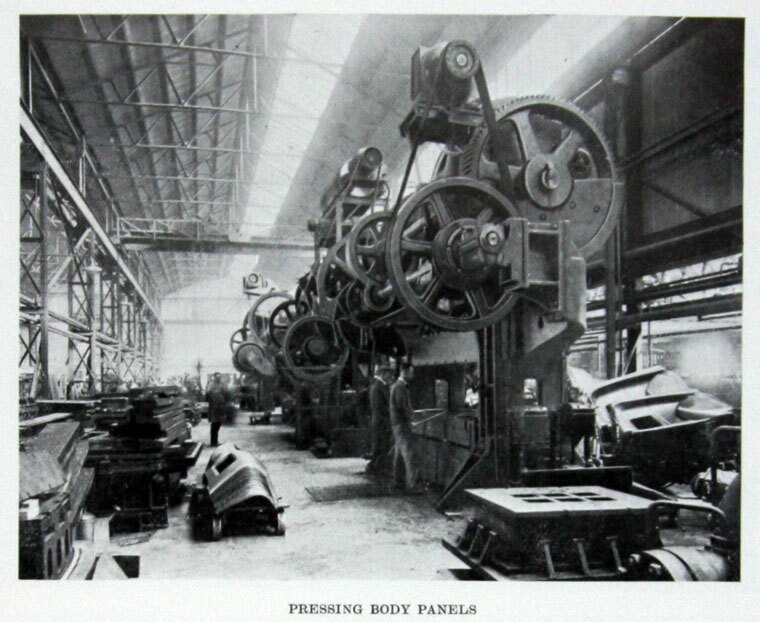 Whereas, in 1907, three men would take about a year to build a car — if we analyse production in conjunction with the workers employed — and in 1922 one man in a year could produce a motor car and do a little bit towards another, to-day the factory is so efficiently organized that the annual production amounts to over four cars per employee. Throughout the factory immense strides have been made in production methods; many thousands of pounds have been spent on the installation of plant of the latest type. Thousands of operations now require only a quarter of the time they formerly took. Innumerable instances occur throughout the works of production being speeded up to the ratio of 4 to 1. At Longbridge, plant ranging in price downward from some £11,000 for a single machine is to be found, and the total value of machines in this huge factory must be well over one and a half million pounds. There are over 5,500 of them at Longbridge, and practically every basic industry involved in the production of a motor car is included. Drop-stampings, for axles, crankshafts, crown-wheels and flywheels, and over 790 other parts, are produced in profusion in the drop-stamping shops. The Austin Foundry produces well over 200 cylinder blocks a day to meet the demand of the engine machine shops, and all Austin radiators are made, from strip metal, in a plant most up-to-date. A short account such as this cannot convey adequately the ramifications and extent of this concern. To produce a modern car that will perform up to the standard of dependability which has become synonymous with the name of Austin, involves a far higher degree of organization than the general public realizes. 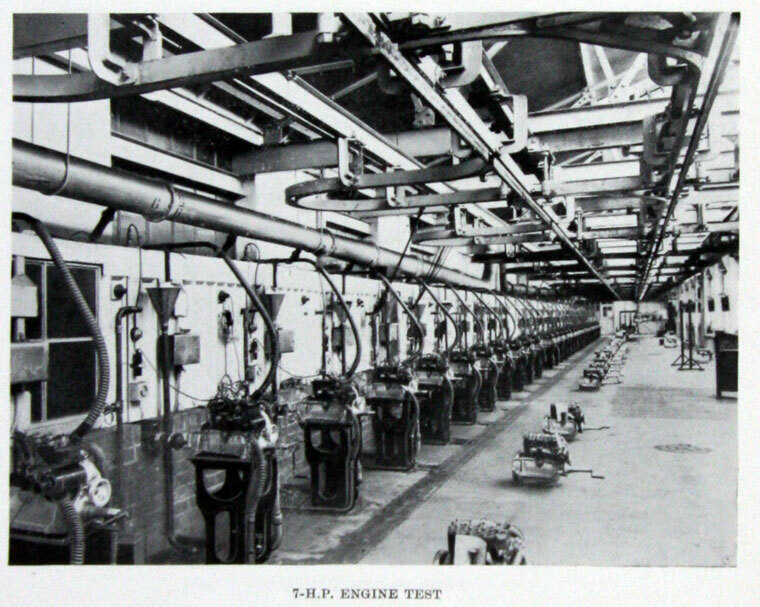 When we are told that almost one chassis leaves the erecting lines every two minutes, we have to grasp that in the whole factory some 5,000 machines and many thousands of workers are so organized that production can proceed smoothly without any delays, to give the normal output for each working week of well over 1,500 cars. This page was last edited on 9 June 2009, at 09:57.